In medieval times, the town of Villavallelonga was Rocca di Cerro. The translation is "Rock of the Oak Tree." Long ago, there was a very large, old, and prominent oak tree at the top of the hill where Villavallelonga now sits. Because the hill was named the rock and the oak tree was at its very top, the site was named Rock of the Oak Tree. 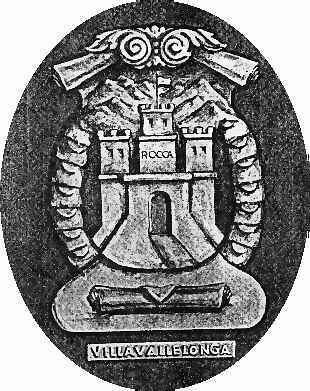 Villavallelonga also had one other name prior to Rocca di Cerro but I have not been able to retrieve it at this time. The coat of arms of Villavallelonga. In medieval times, Villavallelonga was enclosed with high walls to keep brigands from entering. There were only three entarances to it. The three doors were closed at night. At each entrance, there were three towers where guards could keep watch. The towers were destroyed in the eartquake of 1905. 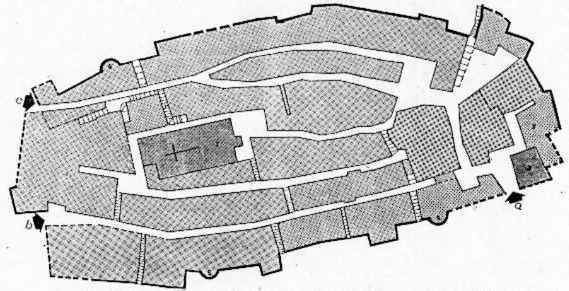 Click the following to see a map of old Villavallelonga where the three towers were located.